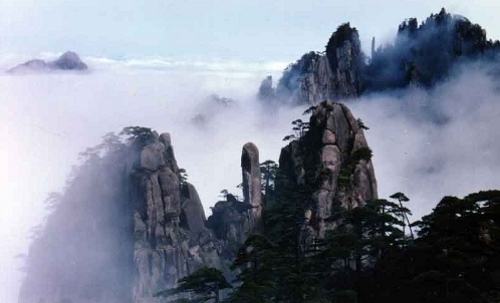 Friends, I want to remind you of our China painting trip this September. Please check our "China trip webpage" (or click the widget on the right) to get detailed information and sign up. Our trip to China last year was very successful. Some travelers even want to go again this year. After the trip announcement in February, many friends emailed us asking information. I know many of you are thinking about participating this time, but need to see if it is possible for you to arrange to go. However, time flies by so fast. Traveling to China takes extra time to take care of logistics. We need to start to preparing for the trip including applying for visas, booking the international travel, and preparing the tour. We have been informed by our Chinese tour company that they need to know how many people are going so they can start to reserve hotel rooms and domestic travel in China. Since we will visit some very popular places, we need to reserve the rooms several months ahead. So far we still have openings for this trip. If you are interested in signing up please register as soon as possible. We would like to close the trip applications on May 31, 2014, so we can confirm how many people are going and provide the information to our Chinese tour company, so they can issue the necessary invitation documents for the visa applications. If you have already decided to sign up, please click Registration. I am looking forward to having a fantastic time in China with you. After the Whidbey Island workshop, Song and I decided spending a few days in the Olympic National Park. This is a photo I took yesterday morning. The beauty in the park is unbelievable. The new spring green overlapped the dark evergreen. The shows come and go. We were caught into this beautiful scene surprisingly. Life is full of surprises. I was lucky to be at the right place and right time. Please enjoy. My workshop at Whidbey Island was 4-day. Upon on the request, I did this portrait demo from live on the last day. I have not painted portraits for a while. I was a little nervous at the beginning, but the result turned out OK. Everybody has enjoyed this demo. "Demo at Whidbey Island 2014 3"
The third demo is high key and show how I paint flowers. I had cherry blossom this time. It is a very complicated flower. This is the second demo I did for the workshop. I feel I have mission to accomplish. You see the background color of this painting. It is a so called "dirty" or "muddy" color. Currently I don't have very clear understanding how to distinguish "muddy" and "muted" colors. I know there must be some identifiable factor to tell the difference. I believe a color looks muddy in one condition and looks muted (but clean) under another condition. They are actually the same color. The key is to figure out in WHAT condition this will happen. The background color for this painting works well. Can you tell me why? Feels great coming back to Whidbey Island, WA. I want to thank Cary Jurriaans for organizing this workshop, and thank all the artist friends from all over for attending. In this workshop we have an artist coming from South Africa. I really appreciate the support from all of you to my art and teaching. Art has no borders and no language barriers. I am so grateful I stepped in to this wonderful field. The blue bonnet season is coming to the end this year in Texas. I did this painting with my residue momentum of my high key exploration. I will pause of my small painting exercise and go to Seattle for a week. So this painting may be my last glimpse of this beautiful flower for 2014. However, something ends implies something new will happen. I am looking forward the special beauty in the spring of the Washington State. Now I start to realize the significance of knowing that everything will reach its end eventually. We tend to hold on what we have and feel sad when we reach to the end or death. However, the truth is that this ending feeling is the biggest illusion. We all have an eternal life, here now and forever. Ending is always the beginning. I will see new flowers, they are different, but equally beautiful. I am glad the tax time is over. I have been glued on Turbo Tax solidly for about a week and categorized every dollar I have spent. I really want to thank Tricia Butler for guiding me through the whole process. I can't believe I have dealt with more than five thousand transactions and money went in, out, and between among more than 18 financial accounts. I know all of you have to deal with the same thing and I have no place to brag how much I have achieved in the field of accounting. You know I rather spend more time painting, but without know the art of living, I don't think I can survive. I have to step on the brakes for my high key experiment now. Very soon, I will travel again. I did this 9x12 today, partially as a demo to my Austin mentor group. After the class, I have added more stuff in the setup. So far I can't say I like high key better than my usual low key approach, but this experiment is not bad. However, it is definitely incomplete. My understanding about color is still very fuzzy. I will continue for sure when I get another chance in the future. Easter is the time I see so many pastel colors. It is suitable to my recent high key painting experiments very well. I used purple background this time. I thought I was making a purplish gray. According to my CSA, the background color only has a chroma value at 33 (100 means pure color), but somehow the background looks too colorful purple to me, and the photo show it even more colorful. I don't know why. I will work more to achieve a better understanding. My friend Jane brought me some tulips. The colors are so beautiful. I don't remember I painted tulips before. Now you have it. For my recent high key paintings. I really pay attention to the background colors I use. They are colored grays. I am experimenting on how to enhance the colors in the center of focus by using different gray backgrounds. The song I mentioned in my previous blog was "Demons" by Imagine Dragon. My son Jonathan introduced this song to me. In terms of music, Jonathan and I have no generation gap. I continue exploring the high key approach. Putting blue and red together is not a best color combination. Then why did I still do that? To be honest with you, I really don't know at this moment. I always think myself is a rational person, but recently I am not really consistent. Well, it is not true either. These two colors are showing strongly in my emotion lately. Recently, my mood is kind of sad and in rage. I can't explain. I disguise my true self when I face the world. It must be a coincidence, but I heard this lyric: I wanna hide the truth. I wanna shelter you. But with the beast inside, there's nowhere we can hide ....... Now I hear this song all over the places. We really need to think: What is happening, and why? I have got more feeling about high key paintings. It looks like I have stepped into an exciting field. It gives me more opportunities of showing colors. My friend, are you doing your taxes? I am doing mine. Oh boy, I thought I want to live a simple life, but somehow life is getting more and more complicated. Be careful, be mindful, and take it easy (even it is not easy). I confess that I was obsessed in software developing. Thanks to some of you for introducing me to a few online tools and apps. My CSA tool has improved a little, but it still need much more development before it becomes user-friendly. The reason I was into color scheme analysis is that I am dealing with more color designs more with my high key approach. I like the color scheme in my today painting, but I have hard time to explain to you. I have not grabbed the tangible rules of color aesthetics, but I do believe there exist such rules and I will get them eventually. When I was in LA talking with Jeremy Lipking, We discussed Denis Dutton and his thinking about aesthetics. It is possible to understand beauty in a more scientific manner. In order to improve my art. I can not rely only on my intuition and practice. Research and theorizing is also very important. To achieve a good color design, I do "Color Scheme Analysis (CSA)". The image above is an example. 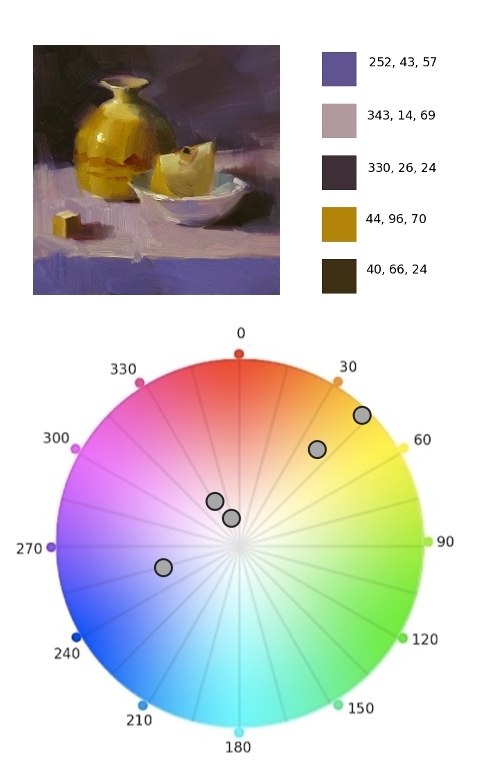 With a painting image, I pick up a few representing color samples, evaluate their HSV (hue, chroma, and value), and map them on the color wheel. The distribution of those colors on the color map informs me if this painting has a good color design. Other way around, if I see a painting appealing to me, I run CSA on it. Its color map will show a specific distribution. Understanding this distribution helps my color designs for my future paintings. I started doing CSA a year ago on GIMP. The process is tedious and time consuming. But I don't know other software that does this and I have no time to develop this tool. These a couple of days, I have figured out a way to plot the color map with NUMBERS on my Mac, but I still need GIMP to obtain HSV values. Eventually I will have an app for everybody to use. If you know similar tools exist, please let me know.